How can I enter a range that will allow a beginning and ending time value? I want to allow applicants the ability to enter what their store hours are for each day; therefore, I would like to use the range option to enter time values (i.e. 6:00 a.m., 7:00 a.m., 8:00 a.m. etc for the beginning range) and replicate this same thing for the ending time value. Can this be done in JotForm? Below is an example of what I'm trying to accomplish using JotForm. You can use two adjacent drop down selectors for this purpose (two for each day). I'll post a form illustrating this solution later today. Here's the form I promised. Is this the sort of setup you want? Incidentally, your screenshot wasn't posted. I happen to come across this post and liked the proposed solution in the link Here's the form. Can you show me how to align the fields horizontally as in the screen below. Using the 'shrink' property does not work as the label will move up of the text field. Appreciate your advise. 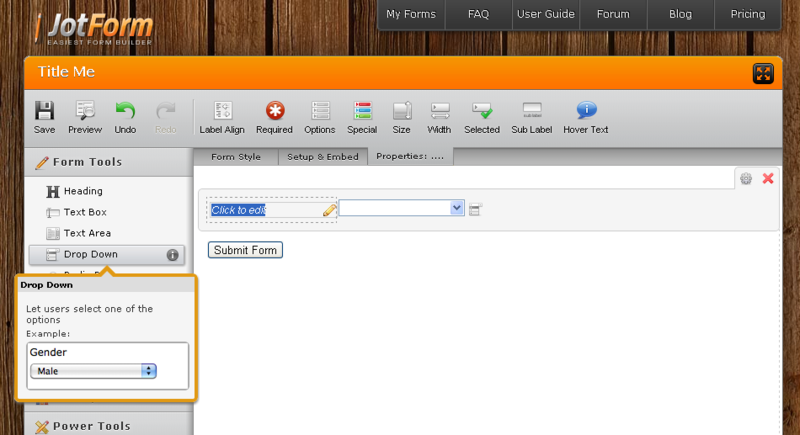 Afterwhich, you can check the form,-- and you will see that Abajan uses injected CSS codes to position/align the fields.